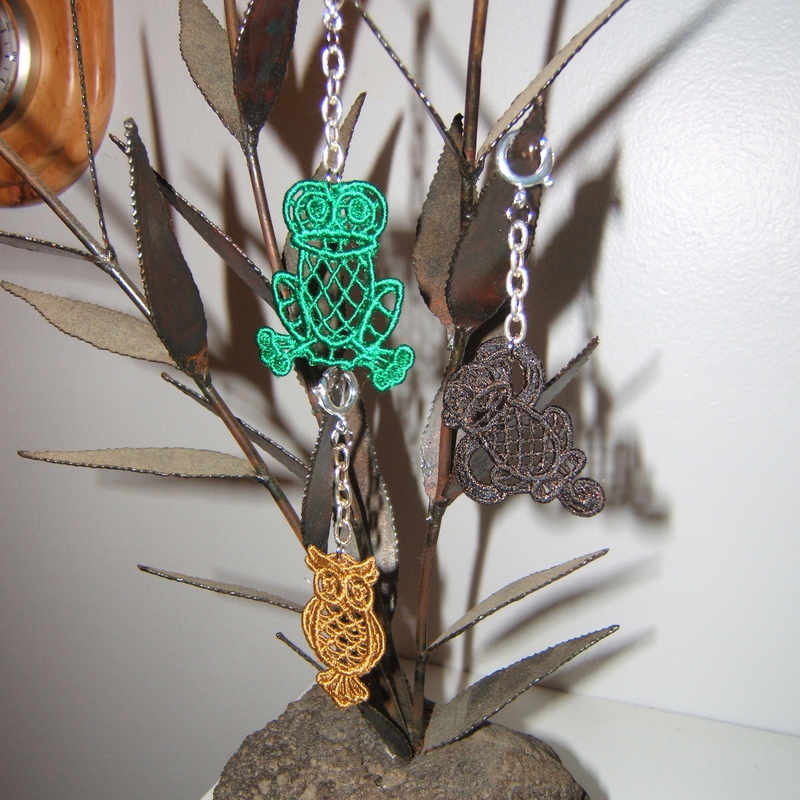 Here are the photos of my crafts I’ve been working on this week that I have noted in some of my blogs. Here are the zipper pulls as I call them, but I don’t know if the opening of the closure will allow to fit into a zipper, so they can be used for other items. These designs were from EmbLibrary and were reduced in size in Embird. I was going to put beads on the eyes, but decided against it. Look close for the monkey in the photo. 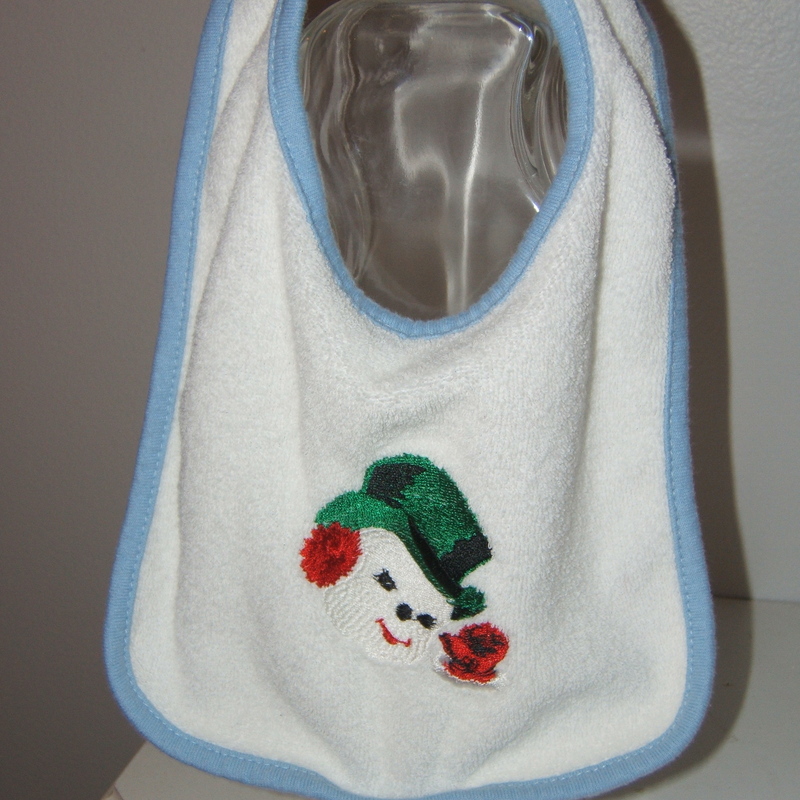 Next bunch of photos are the Christmas Baby Bibs that I made. Made one in blue, pink and white. For some odd reason I am missing a snowman. Don’t know if he melted when he was in the dryer, but I looked twice and couldn’t find him no where. 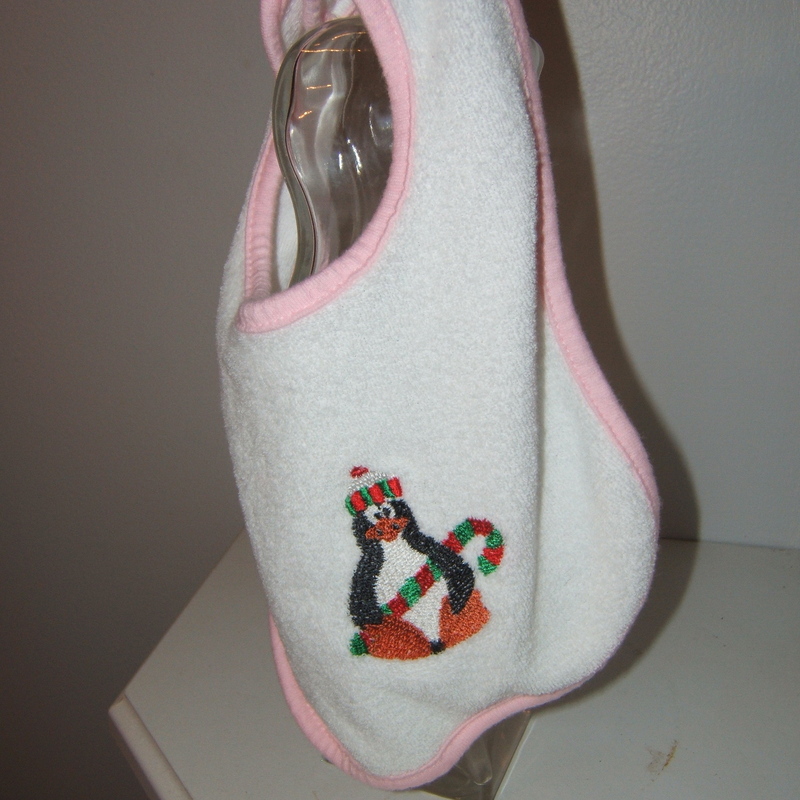 I like Santa Baby and the penquin without the candy cane! 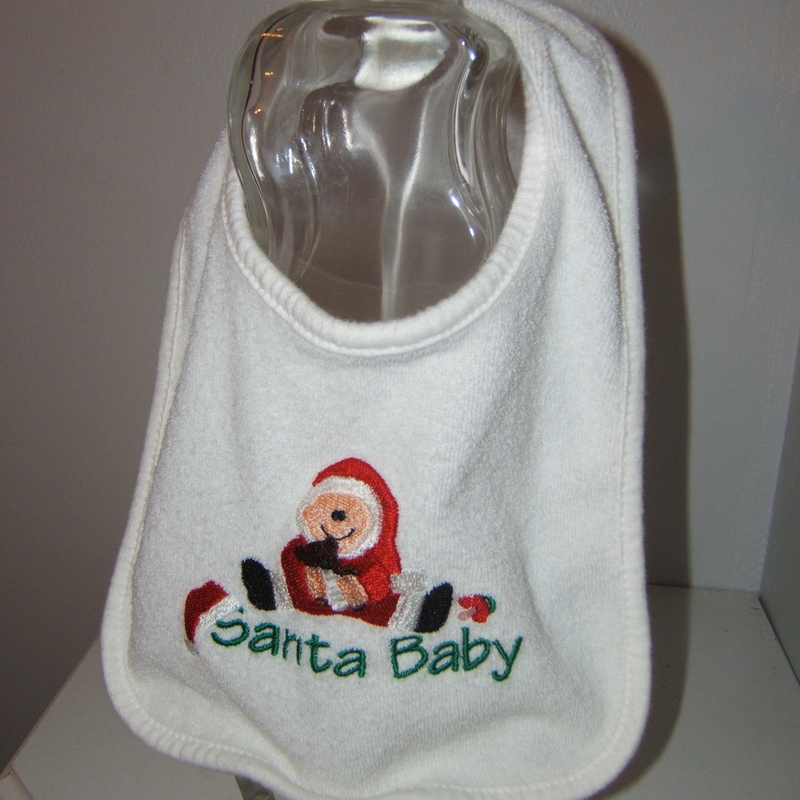 Aw the reindeer bib wouldn’t post…. 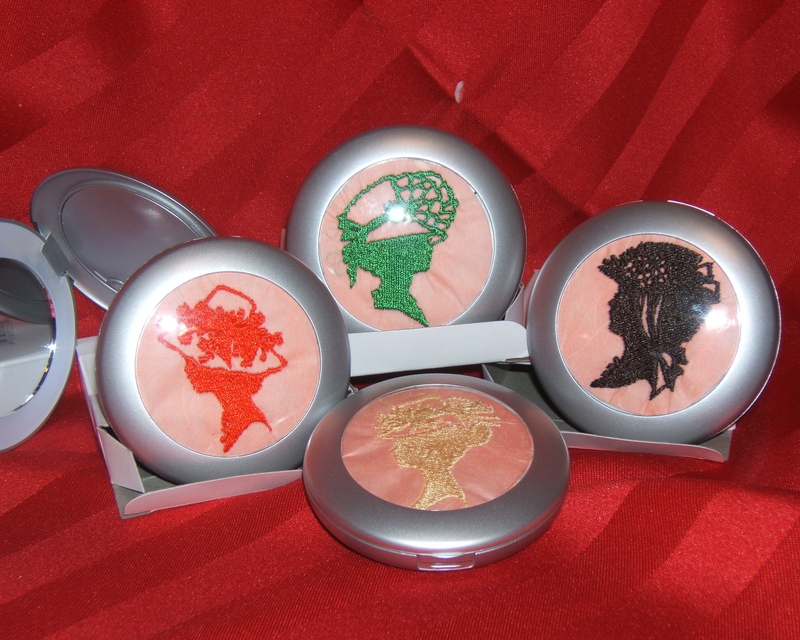 Now here are my lighted compacts that I did today and the last photo is an item I didn’t mention about, but I did it around dinner time. 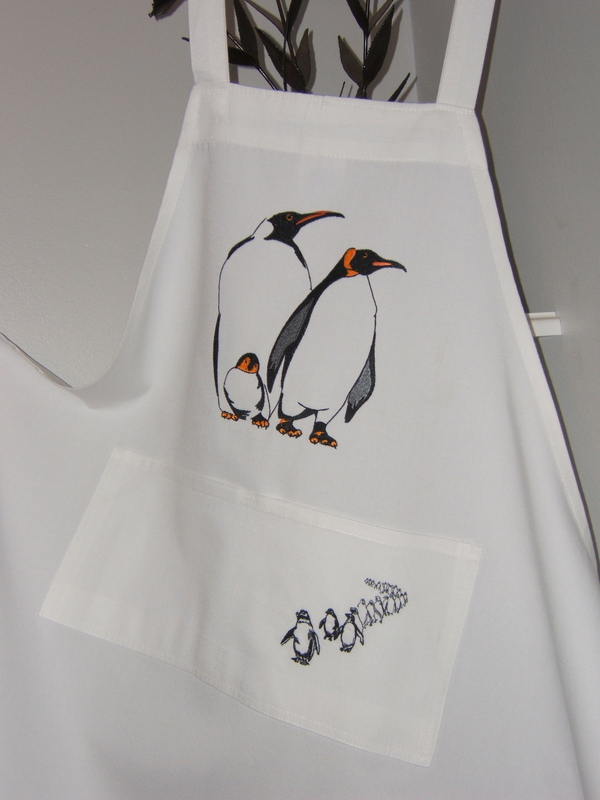 I thought these penquins would look cute on an apron. The designs on the compacts are from Anita Goodesigns, Viva La France and the penquins are from BFC Embroidery and I believe Fred did them. 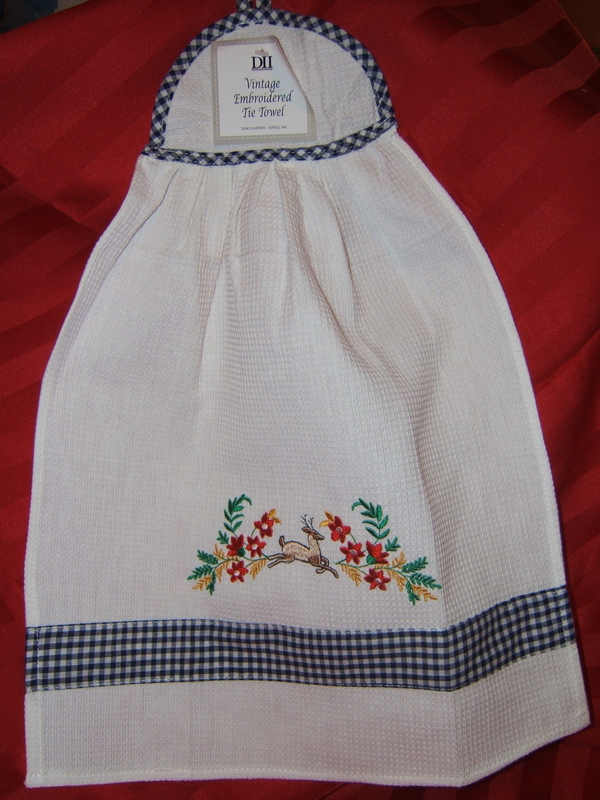 I will be doing a selection of aprons in the coming days, so come back to check them out. 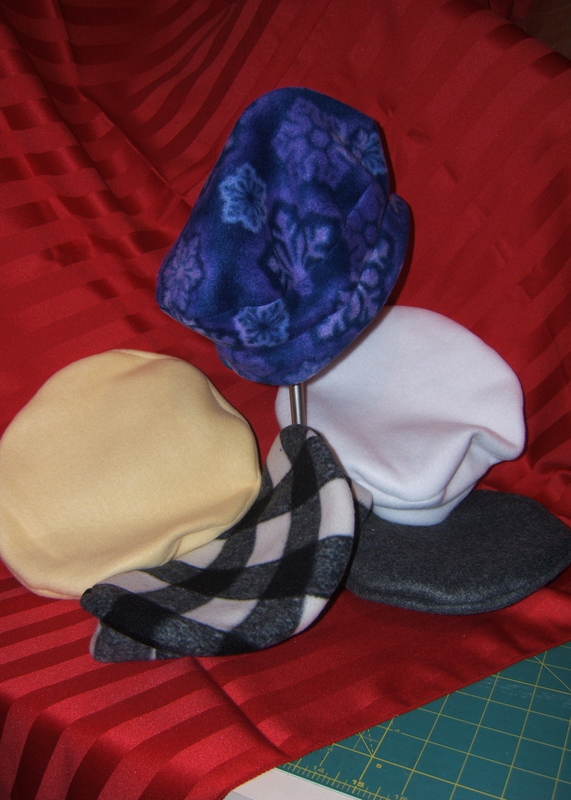 These are some of the berets that I made on Thursday and Friday. I think they turned out real nice. Now I have to have my daughter try on the ones I did yesterday just to make sure that they are just right. I will get some pictures with them on her, under one condition – I don’t show her face. We decided either a hand in front or hair over face will do fine. She doesn’t want to been seen, especially where I will be posting them on ETSY. 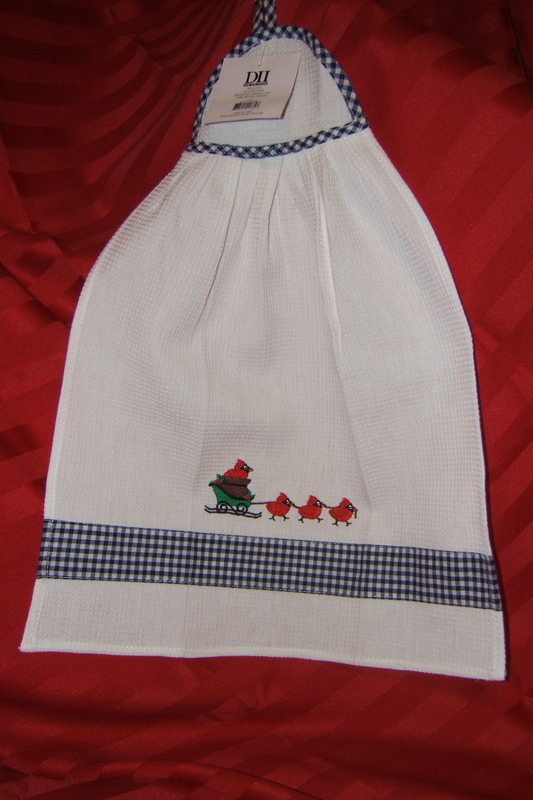 Here are the towels that I did Saturday. The first set is Anita Goodesigns. I don’t know the name of the set, but it is one of Steve’s early sets. I say this because it kept doing jump stitches when there wasn’t a stitch. I did do some color changes, but I am notorious for doing that. The next two groups of towels are from EmbLibrary. 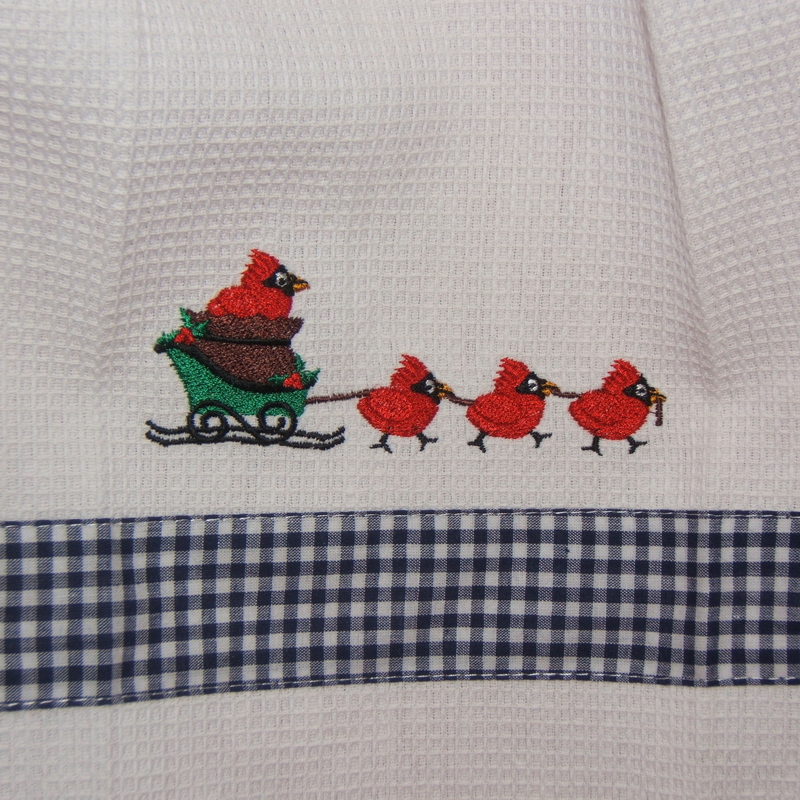 On the first set of cardinals I went into Embird and removed the stitching that resembled snow under the sleigh and running cardinals. I figured you wouldn’t see the stitching putting it on a white background. The problem I encountered with this design is that the bobbin thread did not catch the upper thread, thus the machine kept telling me to check both threads. I ended up having to hold the top thread in order for it to catch and knot. The last design, went into Embird and removed the checkered tablecloth that the bird was sitting on (underneath the green sprays of leaves). 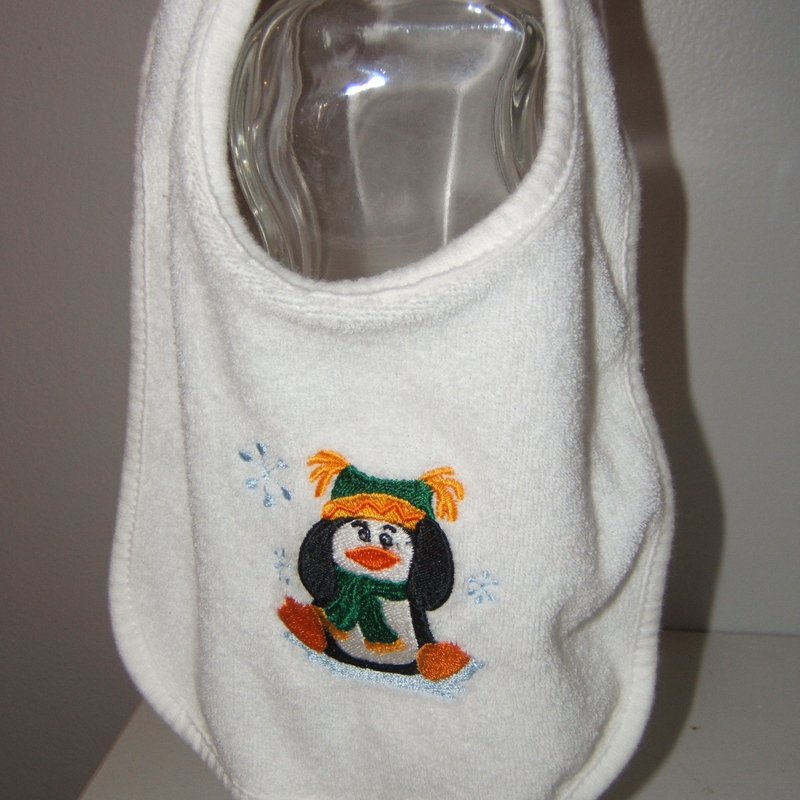 Since the towel already had a checkered border area, it would look crappy. 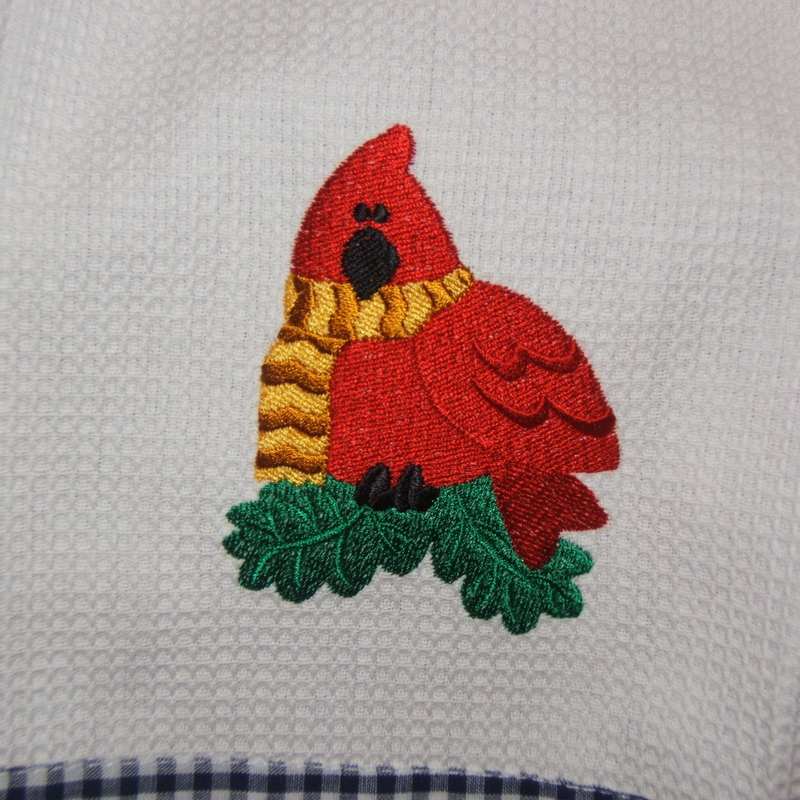 With just the cardinal and the leaves, it does the towel justice. Here I go again, changed the color of the scarf to add punch. 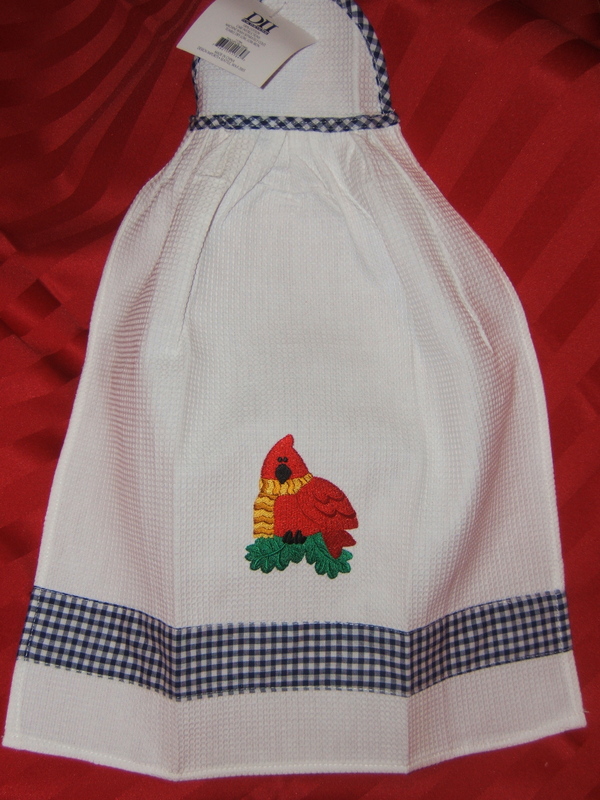 On the first two towels, design placement was made 1/2 inch between the checkered border and the design. The first design was 3 inchs high, take 1/2 of that its 1 1/2, then added 1/2 between design and checkered border, so my actual middle was 2 inches up from the border. On the last one, I did an inch. If I added more between the border and the design, it would have looked really out of place. Each one of these designs took 18 minutes to complete on the PR 600. Went through at least 4 bobbins. Stitch count was anywhere from 8900+ to 15000+. These are the towels that unfortunately Sue from All About Blanks sold out on. They were 3 bucks a piece and like I said they really turned out nice. Whatever I don’t sell at the Holiday Bazaar will go on ETSY prior to Christmas. I do want to take these to the shop in town to see if there is a possibility that I can sell them on commission. Hey got another package in the mail today. Yup my lighted mirror compacts came. I did some embroidery prior to purchase and 3 of the designs that I did I won’t be able to use because of the stitch density. I made some masquerade masks from Loraile and well they don’t allow the back to snap shut. As you can see the vintage cameos fit. They were stitched on paper and material. I have 30 of these to do, but not all of them are going to be cameos. My daughter looked at them and said they were nice, but she didn’t like the erie glow of the compact when lit. Its sorta purplish and gave her the spooks. I should open all 30 of them and put them in her room. 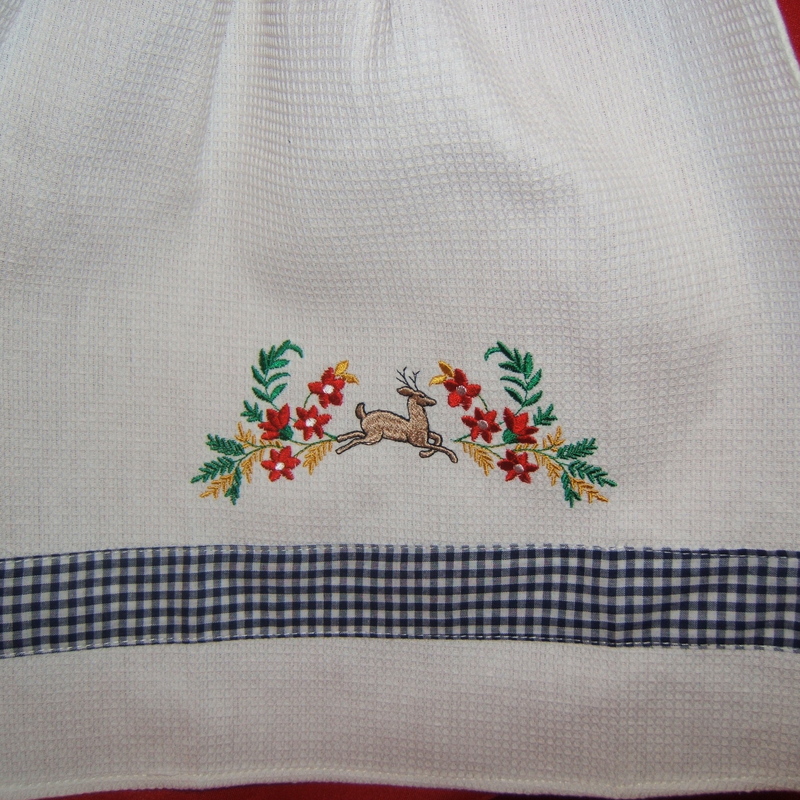 These particular designs were purchase back in 2001 when I first started embroidering. I know that there were some digitilizers that also had these for free when they were first starting out in learning how to digitilize. So now you see what I’ve been up to and how productive I’ve been. Not sure what tomorrow will bring, but if I continue to stay up, I won’t be doing much. If these compacts go over really good, I am considering on purchasing more, but I really need to find a supplier on them instead of purchasing them like I did this time around. Ran into some issues and I could have saved some money on the shipping too. If anyone knows where I might be able to get these as wholesale, please feel free to let me know. Time to let the dog in and quickly run through any emails and hit the bricks. Tomorrow I want to sorta start early (yeah right the daughter sleeps in late tomorrow and my sewing room is next to her bedroom).